"Things go better with Coke! Take my word for it." They call me Lucy. See how my ears perk up when I hear my name. For a long time I thought my name was "Here, boy" but then one day it dawned on me that Lucy was a name, not a lunch meat. And yes, that's a regular sized Diet Coke can beside me. I'm a small dog, okay? Do you want to make something of it? Huh? Listen, I've got teeth, okay small teeth, but they are very strong canines. I floss every day. And I can clamp onto your pant leg so tight that you'd think an iguana attacked you. 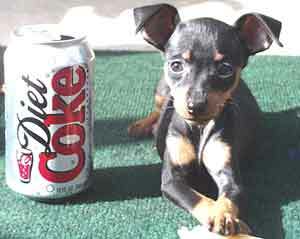 So don't mess with me or my Coke. Got it, gringo? "One inch closer and I'll give you a manicure to remember." This is my friend, Hunny Machado. You remember her, right? She wrote a story for this fine magazine last year. Here's the link, in case you don't remember. Hunny likes TV... a lot. 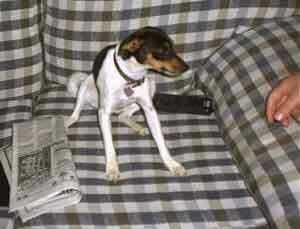 She checks the listings in the San Jose Merc every night. Her favorite channel is Animal Planet. And that's the remote control beside her back haunch. The two-legged loafers in the recliners are always trying to take it away from her, but I showed her my iguana move and now she owns the clicker. She's been doing leg stretches for a year now. You can tell the difference, right? When she stands up, her front end is six inches taller than her rear end. Just ten minutes per day like the video says...you know the one, Paws of Steel. Hunny's got a girlfriend. They call her Dottie, because she's got these two BIG dots on her body. As if...don't get me started again on dog names. 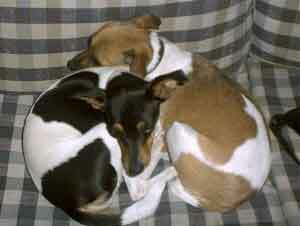 Dottie wanted to be called Jack because she's a Jack Russell terrier, for pete sake. But no, they thought Dottie was cuter. She peed on the carpet a few times just to let them know who's boss when she first came over. But then she she met Hunny and she fell HARD. What a hunk. You should see the paws on that pooch. Oh-la-la. Well, whatever. Those two have been sleeping around for months now. I just don't know where it will lead. When two JR's get together, all hell breaks loose. Me, I'm still single, just hanging around watching the action over at the Akersons whenever I can. They are what we call dog people and they are putty in our paws. We can do whever we want to, like sleeping on the furniture, begging treats, going for walks, watching TV. What could be sweeter? Life is good. Now, bring me another Coke, before I put my iguana moves on you again, okay?